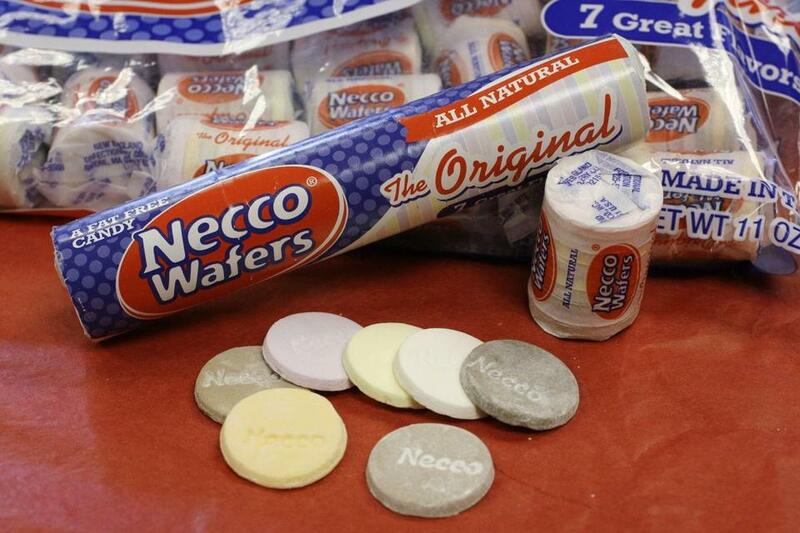 Necco Wafers are New England Confectionery Co.’s best-known candy. It looks like Necco Wafers will continue to roll off the assembly line — at least for now. Family-owned Spangler Candy Company of Ohio — which makes Dum Dums lollipops and the orange marshmallow Circus Peanuts — added Necco to its portfolio Wednesday with a winning bid of $18,830,000 during an auction for the Revere-based candy maker in US Bankruptcy Court in Boston. With a packed gallery looking on during the nearly four-hour-long court session, Spangler beat out offers from Round Hill Investments LLC and Boston-based liquidator Gordon Brothers to become the new owner of the New England Confectionery Co., which traces its roots to 1847. A fourth bidder, kgbdeals Shopping Inc., dropped out before the proceedings started. Bidding, with Chief US Bankruptcy Judge Melvin S. Hoffman presiding, had started at $15,250,000. The result means a reprieve for the country’s oldest continuously operating candy company best known for its chalky Necco Wafers sweets — at least through the fall. Operations will continue in its Revere headquarters, where Necco’s lease has been extended through November. Most of the company’s 232 full-time employees work out of the headquarters on American Legion Highway. The sale is expected to close Friday. Vashaw declined to comment further on the company’s plans for Necco. Both kgbdeals and Gordon Brothers expressed interest in future talks with the winning bidder about potentially buying some Necco assets. Necco’s top executive team, including chief executive Michael McGee, have committed to stay through July 31 during the transition, “and longer if they need us,” McGee said after the auction. Necco’s sugar line products also include Sweethearts, Candy Buttons, Mary Jane, and Canada Mints. Its chocolate line produces Mighty Malts, Haviland Thin Mints, Clark Bars, and the Sky Bar. Wednesday’s auction was the latest twist in Necco’s efforts to find a buyer to continue operations. In March, McGee notified state officials and Revere’s mayor that the company would lay off about 400 workers and executives if it could not find a buyer by May. Necco, owned by New York investment firm Ares Capital, was in private talks for a potential sale with Gordon Brothers, a global firm that specializes in acquiring distressed companies and that is currently working on the liquidation of the Toys ‘R’ Us chain. Negotiations to sell the candy manufacturer to Gordon Brothers for $13.3 million were underway when three of Necco’s creditors in April filed a petition to try to force the candy maker into an involuntary bankruptcy, claiming they were owed more than $1.6 million. In response, Necco filed for Chapter 11 bankruptcy protection but asked the court to waive the federally required auction process, arguing it would probably not yield a better offer than the purchase price offered by Gordon Brothers. The court disagreed, and the auction went forward. Court-appointed trustee Harry B. Murphy, of Boston firm Murphy & King, negotiated with Gordon Brothers to name them the initial bidder at auction. Murphy also negotiated with Necco’s landlords to extend the company’s $300,000-a-month Revere lease, originally set to expire in August, to Nov. 30. The candy manufacturer moved in 2003 from its longtime Cambridge plant to the massive 50-acre Revere site. Atlantic Management Corp. and VMD Cos. bought the property last year for about $55 million. With more overhead than necessary in its current location, Necco will probably relocate if it stays in business beyond the fall, Murphy said. Meantime, the company’s bankruptcy case continues. Creditors have until July 13 to file claims for money they say they’re owed by Necco. In court documents, McGee, Necco’s chief executive, said the company had incurred “substantial” debt with liabilities exceeding $152 million. The new buyer is not responsible for Necco’s past debts.